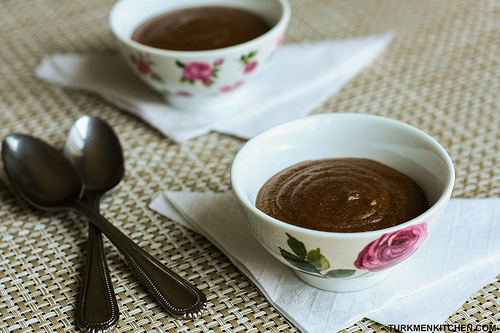 Semeni is a sweet wheat sprout pudding that takes days to prepare and hours to cook. 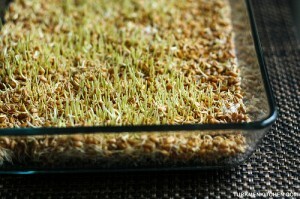 It is traditionally prepared for the Nowruz holiday (March 21) to celebrate the arrival of spring. Happy Nowruz everyone! 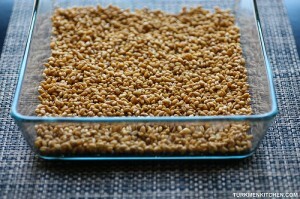 Wash the wheat, then soak in a bowl of cold water for 2 days, changing the water after the first day. On the third day, pour out the water and rinse the wheat a couple of times. 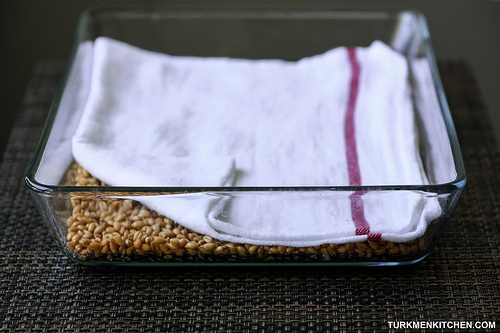 Spread the wheat evenly in a flat dish and cover with a damp cloth. Place the dish in a warm place. Re-dampen the cloth twice a day until the wheat has sprouted enough. 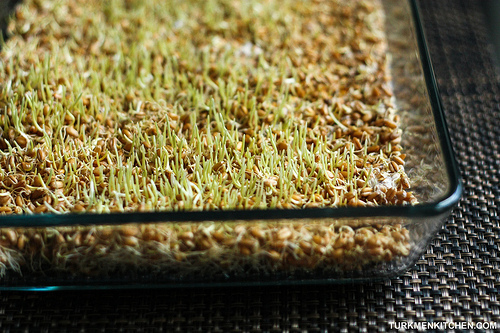 After a day or two, the wheat will have developed fine, white roots, and the sprouts will have begun to turn green. On the sixth day, your wheat will be ready. 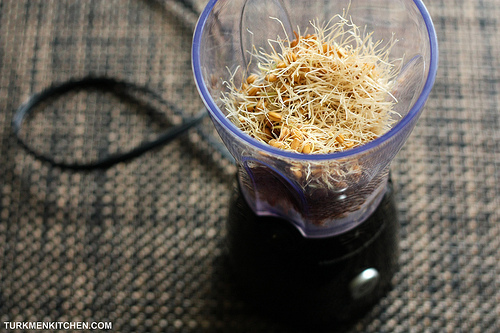 Working in batches, tear up the sprouted wheat, add to a blender along with some water*, and puree until smooth (or grind the whole thing with a meat grinder and then add water). Line a sieve with two layers of cheesecloth and set it over a bowl. Empty the contents of the blender into the sieve. Gather the ends of the cloth together and squeeze out any remaining liquid. Pour the pulp back into the blender, add more water, puree, and pass through the sieve again. Repeat this process 3 times. The liquid will become clearer after the second and third time. Pour the flour into a large pot and gradually add the liquid, stirring thoroughly until no lumps remain. Place the pot over medium heat and stir the mixture continuously until it has thickened. 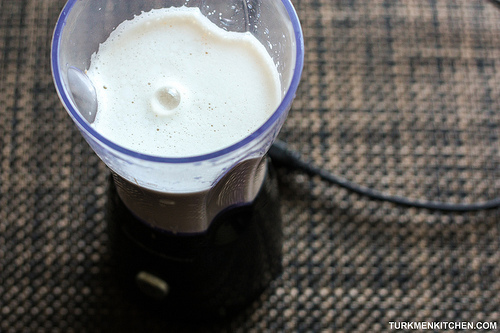 The mixture will begin to turn brown after 25-30 minutes. Once the water has evaporated, add 2 cups of water and stir for another 5 minutes. Turn off the heat, put the lid on the pot, and leave for 25-30 minutes. 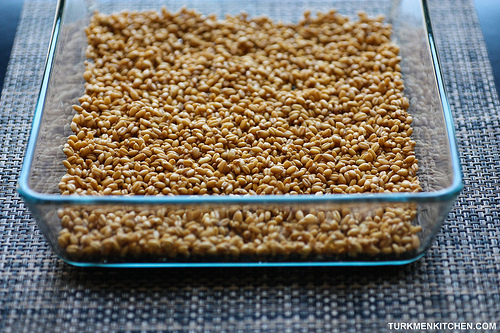 Pour the semeni into a bowl and allow to cool before serving. * I used 10 cups of water in total to puree the sprouts and the pulp. God job, keep going on! This is so interesting. Thank you very much for sharing it. 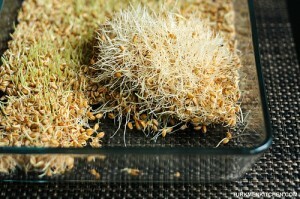 I’d like to ask one question if I may- Once the first little sprouts appear, do you continue to put the teatowel on top? And do the berries need to be rinsed daily until sprouts show? Yes, continue using the tea towel (dampening it twice a day) until your sprouts are ready to be blended. Once you’ve started covering the berries with a towel, you don’t need to rinse them. Good luck!